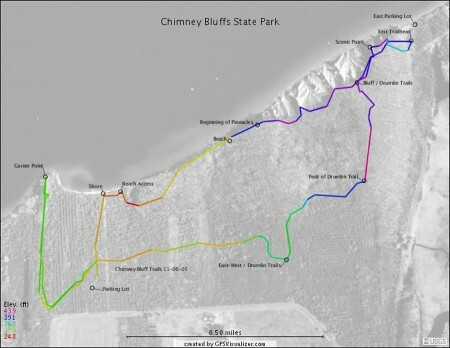 Chimney Bluffs State Park is located on the southern shore of Lake Ontario in the town Huron, New York. 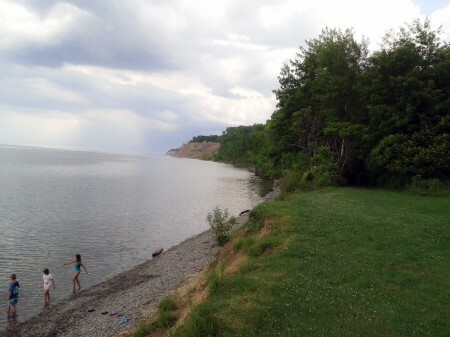 The bluffs line the eastern shore of Sodus Bay. These towering and ever-changing mud cliffs were formed by a receding glacier and first appeared as a drumlin. A drumlin is an elongated hill made up of a loose arrangement of assorted glacial till elements, such as mud, clay, sand, and small rocks. They were formed by the receding action of the last ice-age glaciers, and usually show the final direction of glacial movement. This activity, followed by centuries of rolling waves and accelerated by sustained winds and strong currents, rain, and snow, has carved this landscape into odd-shaped pinnacles called chimneys by the locals. 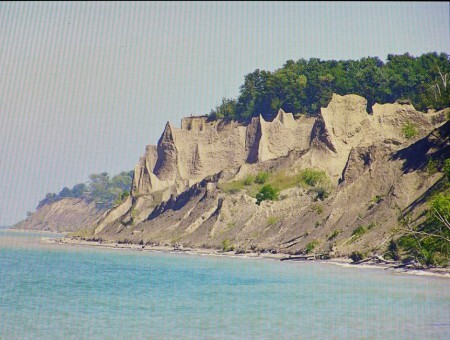 Lake Ontario’s shoreline from Sodus Bay to Oswego has many such bluffs, but Chimney Bluffs is, by far, the most spectacular. 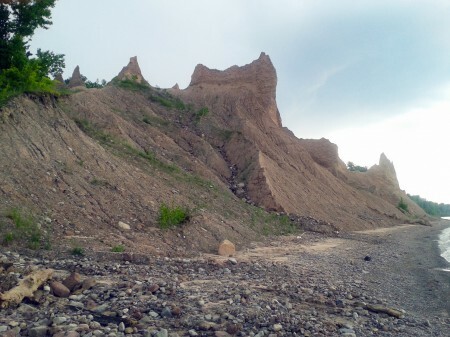 From year to year the bluffs present a changing panorama due to constant erosion, which averages between 1 to 5 feet per year. Recorded history describes impressive pinnacles rising up to 150 feet into the air. Unfortunately, many of these have been worn down. 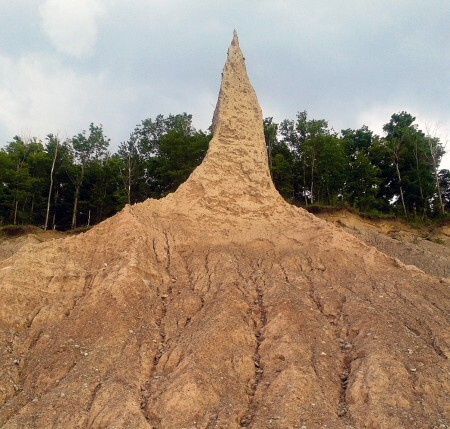 In spite of this, the bluffs never fail to give visitors breathtaking views of Lake Ontario and a sense of wonder about about this region’s natural history. My first experience with the wonders of this part of the world was on a side trip to visit friends in the town of Newark, which is just a few miles southeast of the bluffs. A friend of mine, who grew up in Newark, and I were heading for the Oswego Speedway on Labor Day weekend to watch an annual modified stock car race — The Race of Champions. My friend, Joe, suggested that we stop in Newark to visit his Aunt Ella and hopefully see a few of his friends. We were only in Newark for a couple of hours, but the wonderful people that I met and the stories that I was told about all of the natural wonders that existed in this part of the state made me vow to return for a longer visit as soon as possible. We returned to Newark the following spring. On this return trip Joe introduced me to an affable young woman — Jeannine. He told me that she knew more about this part of New York State than anyone, and she could direct us to the most interesting areas. Well, Joe was right. Our first trip, with Jeannine as our guide, was to Chimney Bluffs. 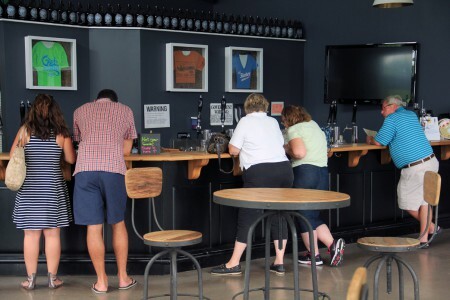 This was followed by trips to many other points of interest along the southern shore of Lake Ontario, including the now-famous wineries that line the shores of the 11 Finger Lakes further south. I have returned to this area with my family several times to visit Jeannine over the years. When Tricia, my wife, asked me when we had visited her last, my answer both surprised and embarrassed me. It had been too long, and a visit was in order. On July 4th we headed to New York to visit Jeannine and hopefully to visit some of my favorite places. The visit was a short one, so we chose to visit my favorite site — Chimney Bluffs. We also spent time at one of the wineries on Seneca Lake. 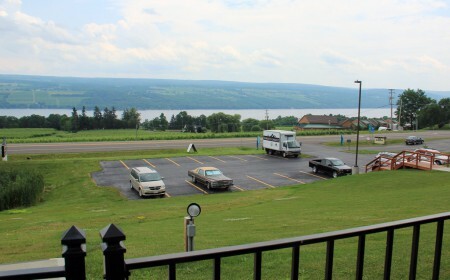 There are over 300 wineries along the Finger Lakes. 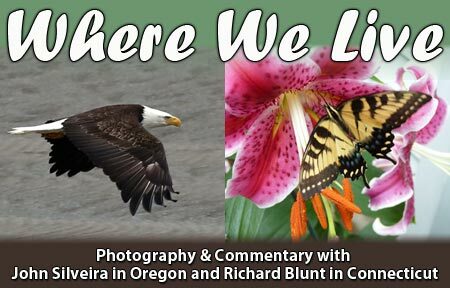 I am planning a return trip to the area to visit and photograph a few of the most interesting ones. A shot of the bluffs taken several years ago. A view of the bluffs in the distance, along the western beach. Looking out over the lake from the Bluff Trail. 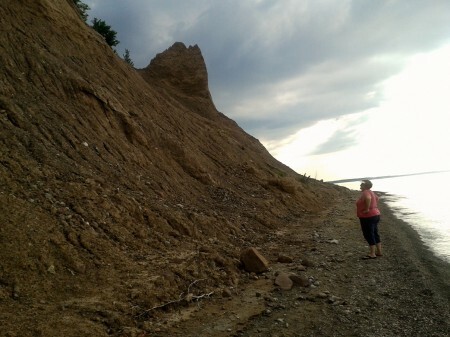 Jeannine detailing, for me, the erosion history of a section of the bluffs that she has held as a favorite since she was a child. 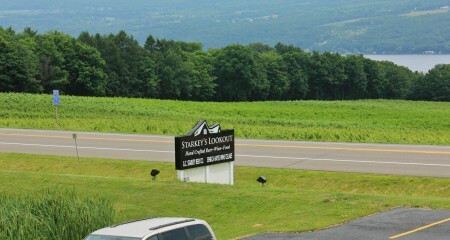 The second day of our visit was a brief tour of the vineyards and wineries along the eastern shore of Seneca Lake. 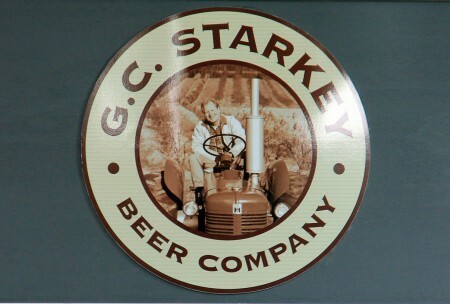 We stopped at Starkey’s Lookout, which is also a fine craft brewery. 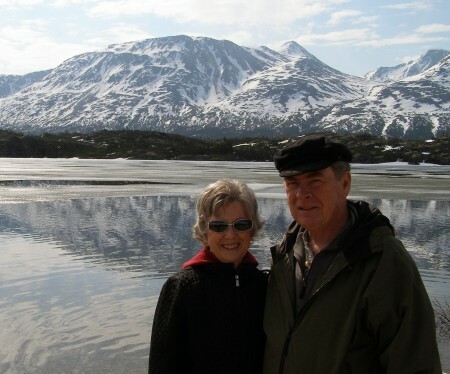 Mike and Jane McLaughlin were enjoying the spectacular vista of Mt. McKinley from a point in Alaska’s Denali National Park in 2011. 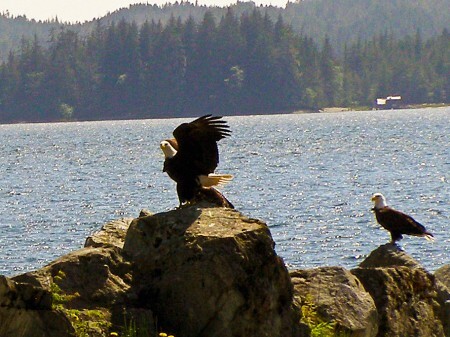 They caught sight of a pair of Bald eagles flying high over their heads. It appeared that they were in some sort of aerial combat, but they were informed by another traveler that this was a mating display. 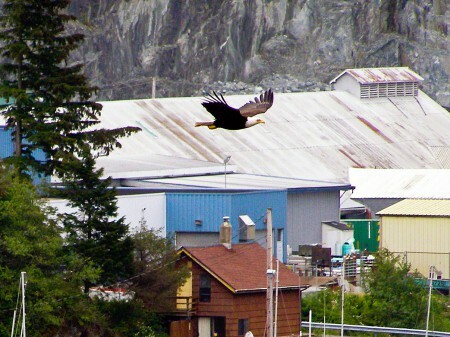 Fascinated, Mike dug out his Olympus DSLR camera and got some great shots of the birds in various settings. 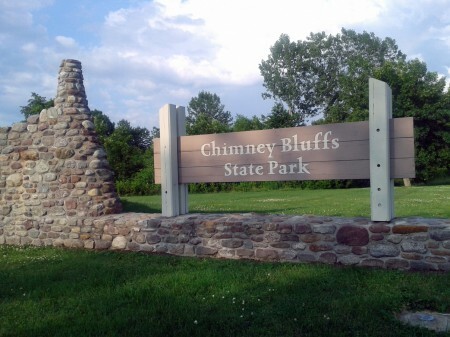 This entry was posted on Monday, August 4th, 2014 at 1:00 pm	and is filed under Public Parks. You can follow any responses to this entry through the RSS 2.0 feed. Both comments and pings are currently closed.